As cyber security professional, I come across many various vulnerabilities from critical to low and sometimes informational(How to categorize- CVSS v3). Sometime back I was doing as usual my security assessment activity for a client (Confidential) for their HRMS web application which was 3rd party software whose vendor was "Adrenalin". In Reflected Cross Site Scripting, the malicious payload has to be send as a part of URL and user should be tricked to visit that URL. However, it has the same impact as that of a persistent XSS. 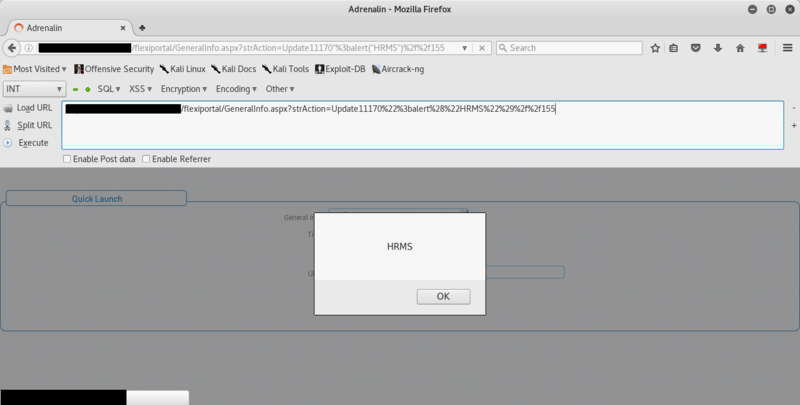 XSS can be used to hijack victim’s session and thereby gaining complete access to his/her user account. Additionally, it can be used to redirect victim to a malicious website which may contain browser exploits or a phishing page. At a basic level XSS works by tricking your application into inserting a <script> tag into your rendered page, or by inserting an On* event into an element. Developers should use the following prevention steps to avoid introducing XSS into their application. Before putting untrusted data into an HTML attribute ensure it's HTML attribute encoded. HTML attribute encoding is a superset of HTML encoding and encodes additional characters such as " and '. Before putting untrusted data into a URL query string ensure it's URL encoded. 12th June,2018- Reflected XSS Vulnerability found in the software. 12th June,2018- Few query asked about the CVE process with same information reported to Mitre without Vendor name and version information. 12th June,2018- Mitre replied with the CVE-ID and asked to inform the vendor about the vulnerability and CVE-ID is generated. 28th June,2018- The Vendor Replied and the full report of the vulnerability sent to the Vendor. 2nd July,2018- The XSS Instance was patched on cloud version of the software. As cyber security professional, I come across many various vulnerabilities from critical to low and sometimes informational(How to categorize- CVSS v3). Sometime back, I was doing as usual my security assessment activity for a Client (Confidential) for their HRMS web application which was 3rd party software whose vendor was "Adrenalin". "Today I have read Hacker attacked the cyber security world with new attack. Who is Hacker? What is cyber security?" Have you noticed that everyone is updating their policies before 25 May? Why?What is General Data Protection Regulation and why it is important? As cyber security professional, I come across many various vulnerabilities from critical to low and sometimes informational(How to categorize- CVSS v3). Sometime back I was doing as usual my security assessment activity for a Bank(Confidential) for their HRMS web application which was 3rd party software whose vendor was "Adrenalin".